Why Janpath, sir? Is there a monument nearby?" I asked, jotting down the location hurriedly in my notebook. “You are researching bats and you haven’t been to Janpath?" This was early 2014 and I was talking to Vasant Swarnkar, the then superintending archaeologist of the Delhi circle of the Archaeological Survey of India (ASI). I had just begun my doctoral research on the bats of Delhi with Sumit Dookia, a wildlife biologist and assistant professor at Indraprastha University, Delhi, and was visiting the ASI office to seek permission to study the bats roosting in various Mughal-era monuments in the city. I had already made casual visits to several monuments that had bat roosts, particularly insectivorous species, but was unaware of the fruit bats roosting in the large leafy branches of the avenue trees in Lutyens’ Delhi, right in the heart of the city. My first visit to the area was with a relatively untrained eye. I was looking at the colonial bungalows and marvelling at the beauty of the giant trees outside, wondering how old they must be. Things changed when I looked up at the tree. Hundreds of bats were clinging to its branches, some sleeping, others flapping their wings. Excited, I scanned them through my binoculars. They suddenly seemed to become a little more active, and their gleaming eyes stared back at me. Thus began my tryst with these magnificent creatures, considered pests by fruit-growers, listed as “vermin" in the Indian Wildlife (Protection) Act, 1972, and often disliked for the noise they make. These fruit bats (Pteropus giganteus), commonly known as the Indian flying fox, can be seen on almost all the Arjuna (Terminalia arjuna) trees on Janpath in New Delhi. They can also be seen on the Ashoka (Polyalthia longifolia) and jamun (Syzygium cumini) trees on Motilal Nehru Marg and Akbar Road, sharing their abode with the biggest political names of the country, including the prime minister. Though the Arjuna trees host most of the bat population, they can also be found in the old ficus trees at the roundabout at Windsor Place. Take a good look and you will see these bats resting quietly after a long night of foraging even as vehicles pass by, oblivious to their presence, and armed personnel keep vigil at the gates of the bungalows housing VIPs. After my repeated visits, I began to feel they had got somewhat used to me, staring as I noted down their behaviour, occasionally dropping a half-eaten Arjuna fruit. This coexistence is interesting and baffling at the same time. Ecologists have coined a term for the adaptation of wildlife to urban environment—“synurbization". It is closely related to another term— “synanthropization", which refers to the adaptation of animal populations to the unnatural conditions created by humans. There isn’t enough evidence to imply that these fruit bats exhibit any of these phenomena, as we lack studies related to bats in our country. Delhi has had only three survey-based studies post independence, mine being the fourth. The first survey was done by Andre Brosset in 1962, while he was compiling a publication on the bats of central and western India. Then, scientists from the Zoological Survey of India, N.K. Sinha and J.P. Sati, included bats in their survey of mammals in 1997 while compiling the State Fauna series of Delhi. A third study was done in 2007 by C. Srinivasulu and B. Srinivasulu, in which they gave a checklist of 13 species of bats from Delhi. The Indian flying fox is India’s largest bat species, and one of the largest bats in the world, with a wing span of 1.2-1.5m. They are either frugivorous (eating fruits) or nectarivorous (drinking nectar). As mammals, they give birth to pups, with the breeding season lasting from July-October. The mother carries the pups with her for the first few weeks. As nocturnal creatures, they laze and sleep for most of the day, becoming active at dusk. Flying around the trees in large numbers, they squeal and chirp, roosting on trees with some water bodies nearby, in the vicinity of India Gate and Rashtrapati Bhavan. Water is the first thing they have before they set out to forage. A few times, I have seen a flying fox swoop down on the sarovar of the Bangla Sahib gurdwara a little after midnight. In the hot summer months, when the temperature nears 45 degrees Celsius, they can be seen flapping their wings frantically and sticking their tongues out to beat the heat. In winters—which are equally extreme in Delhi, with temperatures often falling below 5 degrees Celsius—they remain tightly huddled, rubbing their bodies together to generate heat. Delhi also has two more species of fruit-eating bats—the short-nosed fruit bat, Cynopterus sphinx, and the fulvous fruit bat, Rousettus leschenaultii. They are much smaller in size and a little difficult to spot. While the former roosts in small groups high up in dense tree foliage, making small tents out of tree leaves, the latter can be seen roosting in the hundreds of thousands if you walk down the steps of Agrasen ki Baoli, and into the dome. 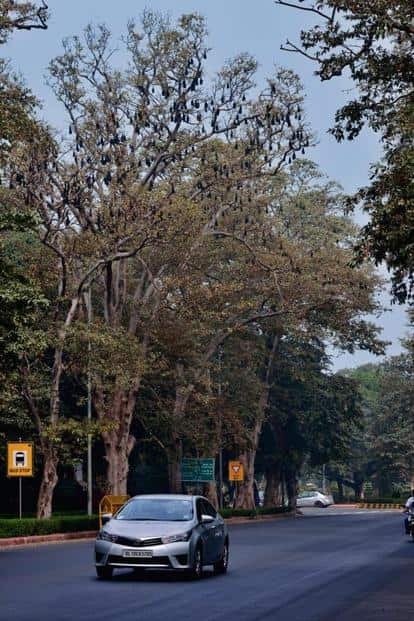 I wonder whether Sir Edwin Lutyens, meticulously designing the architecture of British New Delhi in 1912, had a premonition that bats would use the avenue trees as their home. For the trees were an integral part of the design. In his book Trees Of Delhi: A Field Guide, author Pradip Krishen quotes Captain George Swinton, chairman of the town-planning committee for the new capital, as saying: “Trees will be everywhere, in every garden however small it be, and along the sides of every roadway, and Imperial Delhi will be in the main a sea of foliage. It may be called a city, but it is going to be quite different from any city the world has known." We don’t know how long bats have been roosting on the avenue trees, though some literature from the 1950s does locate them in the city. Flying foxes generally roost on trees that are old and aged, owing to their strong trunks and foliage, says Dookia. “Flying foxes mostly roost on banyan (Ficus bengalensis) and pipal (Ficus religiosa) trees in Rajasthan. A big colony roosts on a centuries-old banyan tree in Balsamand Palace, belonging to the royal family of Jodhpur. The signboard under the tree lists its age as 550 years," he adds. When I wanted to study the insectivorous species roosting in the tombs and monuments of the Mughal era—many of them now secluded, and home to small-time hooligans—I often had to seek the help of guards deployed by the ASI, or Delhi Police constables, asking them to accompany me. But here I was, under the green canopy of dense foliage in Janpath, looking at the creatures I so loved with carefree concentration. There are many myths associated with bats. They may feed on fruit but the numerous ecosystem services provided by them tend to be ignored—the benefits of their pollination and seed propagation often outweigh the impact of the former. I love watching these bats flap their wings above me, making chirping noises. But not everyone does. I have come across complaints from some bungalows in Lutyens’ Delhi, about the need to displace the bats as they cause a lot of noise and disturbance. When I last saw them in late December, they showed not an iota of activity, their wings tightly closed over their bodies to trap their body heat. With spring here, they would have started flapping their wings over the fresh-flowering branches of the Arjuna trees.